A typical characteristic of steam distribution mains is that the amount of condensate generated in them is usually quite small. Steam traps used for main drainage have long hours of operation and are often installed outdoors. These traps should therefore have the lowest possible functional steam loss to minimize operating cost over the long term and provide long, reliable service. The TLV SS / SH / FS series have been designed with precisely these points in mind, offering a range of features that make them ideal for use on steam distribution mains. In Free Float® traps, which use no levers or hinges, the float is moved by the buoyant force of the condensate. The distance between the float and the orifice changes in response to the amount of condensate that enters the trap. The float itself acts as the valve head, opening and closing against the seat based on the condensate level in the trap. Because the Free Float® itself - a precision-ground hollow sphere - is the valve, the entire surface of the float functions as the sealing component. This guarantees superior reliability and long service life. For Free Float® in general, a constant water seal is present to prevent steam loss under normal operation. For applications involving the almost no-load conditions of superheated steam, the 3-point seated Free Float® traps are ideal. The 3-point seat provides a precisely machined seating surface and further improves the exceptionally tight sealing. With 3-point seating, there is virtually no steam (or air or gas) leakage even in the absence of a water seal. The combination of the 3-point seat and the precision-ground float yields superior sealing properties and long service life. 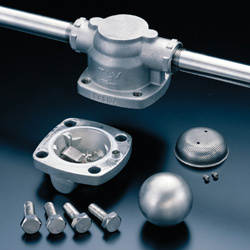 The 4-bolt connector provides easy maintenance. In typical disc type traps, when air reaches the inlet, the disc is closed and the air cannot be discharged. In the Free Float® Steam Trap Series for Main Lines, the bimetal strip reacts to the condensate temperature. When the bimetal is cold, it holds the float up away from the orifice, which automatically and rapidly discharges any air and cold condensate. This can eliminate the need to open a bypass valve each time the equipment is started up and then close the valve after the line is purged, which saves on the cost of labor. The built-in bimetal air vent rapidly discharges the initial air. The cover eliminates the need for additional insulation measures, as the ceramic fiber insulating material offers highly effective insulation. The cover also provides protection for personnel against the hot surface of the trap. The stainless steel exterior provides superior durability while remaining visually appealing indefinitely. The insulated cover minimizes the effects of wind and weather, which results in substantial energy savings. Each model in the SS1 / SS3 / SS5 series is available in both a vertical and a horizontal type. SH5VL is available only in a vertical type. The trap can be easily and economically replaced by simply removing 2 bolts. It can be installed on either horizontal or vertical piping. The SST steam trap series is designed for minimal steam loss at time of condensate discharge, long-term stable performance, and for use on steam distribution mains.